Day 90. 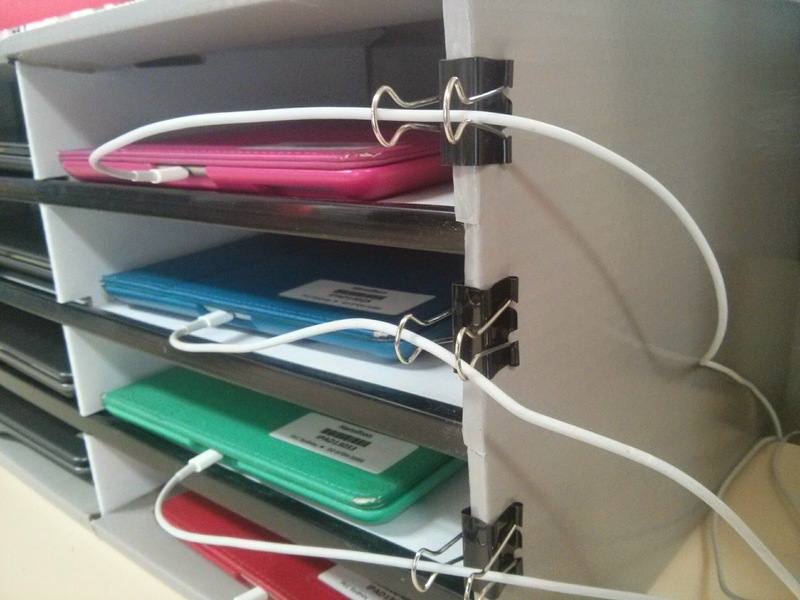 Today's create is a solution to a problem of storing our classroom devices. 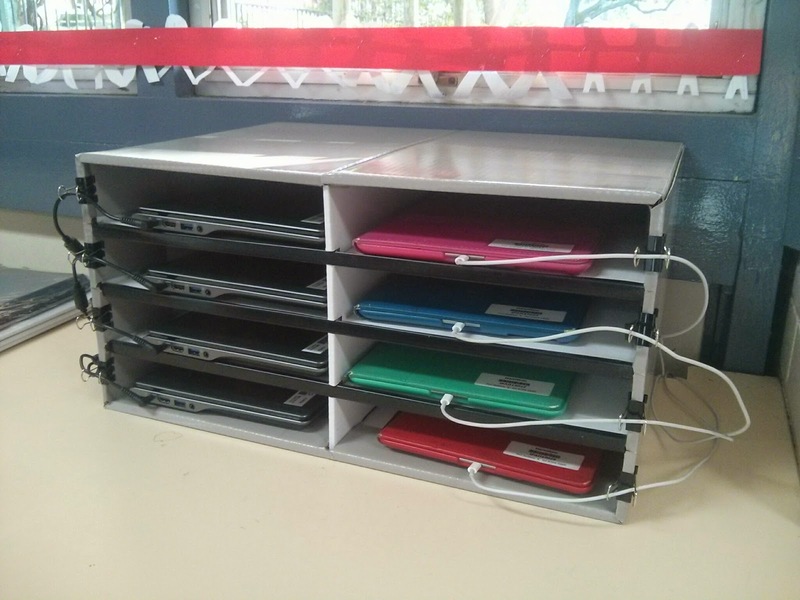 Each of your Year 3 and 4 classrooms now have four pads and four Chromebooks for the students to use in class. 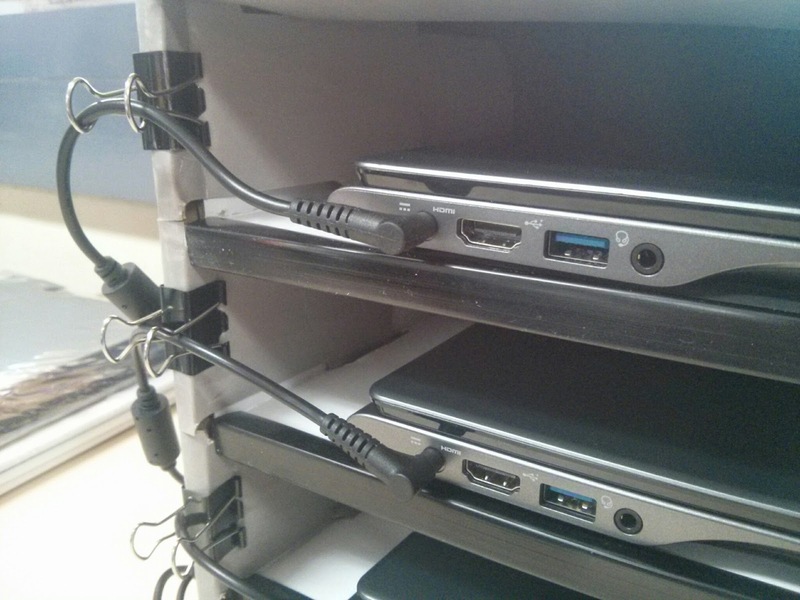 Rather than buying an expensive trolley solution, I got hold of an inexpensive cardboard storage unit from Marbig, then used bulldog clips as cable organisers. Cheap. Simple. Robust. Recyclable. Problem solved. Day 89. Today Linda and I did some exploring up on Sydney's Northern Beaches. We started with a late breakfast on the beach at Collaroy, followed by a walk along the sand up to South Narrabeen. We then drove up to Palm Beach for a swim and another stroll, before heading home via Whale Beach. 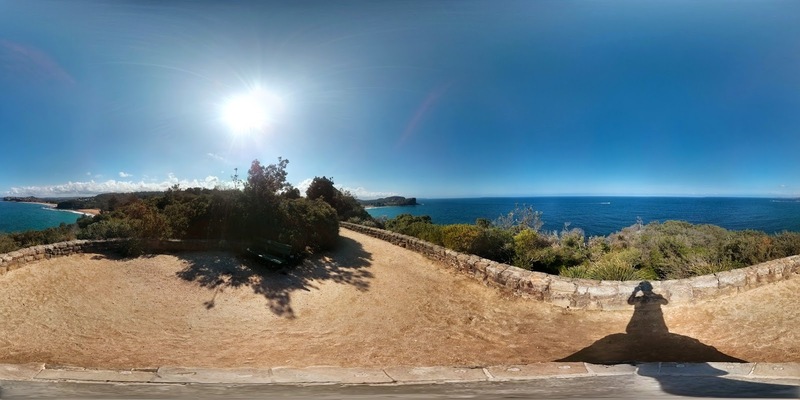 Along the way we stopped at Bilgola Lookout where I created this Photosphere. Photospheres are a standard camera feature in Nexus phones, which let you make these full 360˚ panoramic shots. Day 88. So the other day I discovered the iPad app called Loopy and I made a silly little sample with it, totally having no idea what I was actually doing. After playing around with it a bit more,. it makes a lot more sense to me now, including the recording function. Then the following day, I saw a YouTube clip with Jimmy Fallon and Billy Joel using the very same app to record The Lion Sleeps Tonight. Using that as a bit of silly inspiration, I decided to have a go at making a version myself. The big thing I now know about Loopy is that you can set up loops of various duration (number of bars) and then turn them on and off as you record. Interesting possibilities. More play needed. Day 87. This simple image was created using Adobe Illustrator, one of the Adobe Creative Cloud tools that I use less than others so I'm not as confident with it. 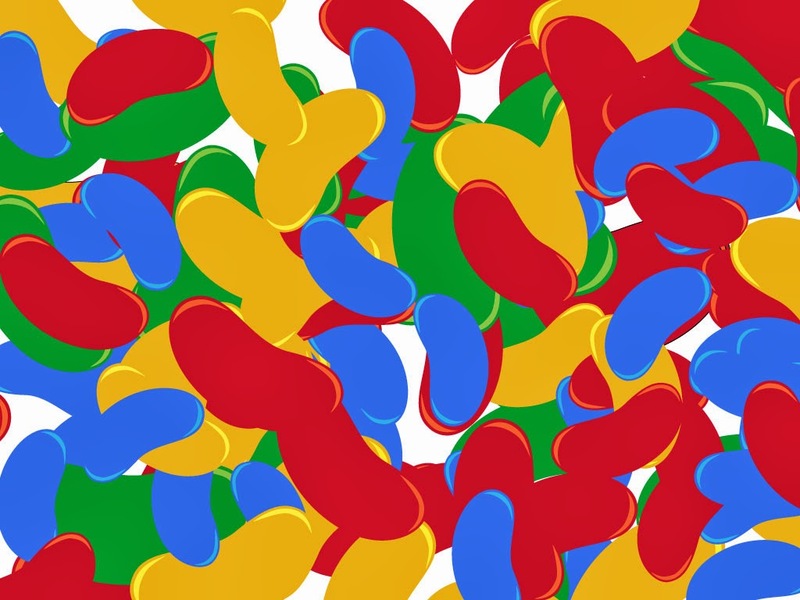 So tonight I was just messing about with Illustrator's pen tool for drawing bezier curves and I drew a nice smooth jelly bean shape. After adding the simple specular highlight shapes I grouped them into a single object, then duplicated it four times, changing the colour of each. The colours, by the way, are based on the hex codes for Google's logo. After making each coloured jelly bean I turned them into scatter brushes so I could paint with them. I adjusted the size, angle and scatter to be randomised, and then each time I dragged a brush across the screen it left a trail of jellybeans. I know it looks simple, but there are quite a few core Illustrator skills involved in making this image. Day 86. today I discovered an app called Loopy, a loop based audio recorder for iOS. Just record a sound, then just dub over and over to create some interesting sequences. This sample was made (as my first attempt, so be nice...) to show how a basic rhythm could be made using nothing but my own voice. Day 85. These photos of Linda and I were taken a while ago in Canberra, and can't even remember what app I used to put us in the film frames. 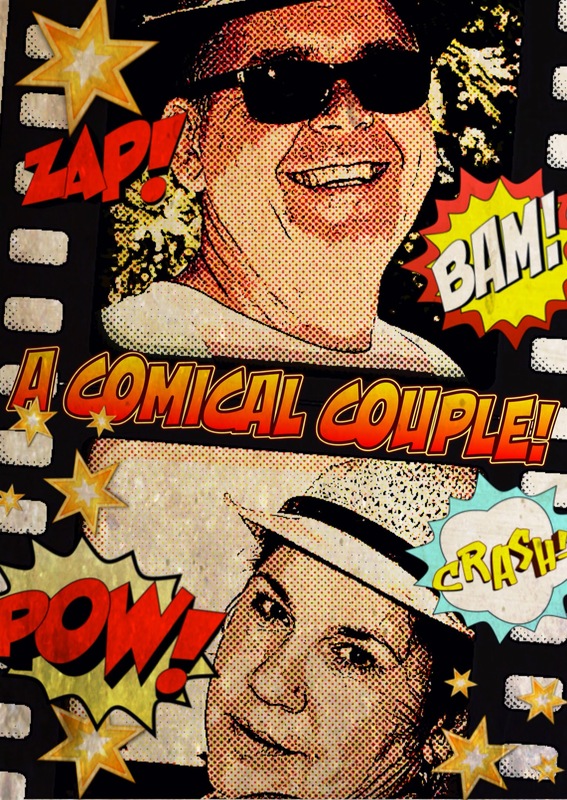 But tonight I found an iPhone app called Comic Touch, currently free on the App Store. It's from Plasq, the same people who make Comic Life. It's a much simpler, one frame comic maker, but pretty good for making a single, simple comic image like this one. Day 84. I was at a Teachmeet this afternoon at the Harold Park Hotel with a group of teachers talking about BYOD in schools. The panel was just setting up and I spotted Laurens, Joachim and Alice sitting there waiting to start. With some Google talk on the agenda, I figured this was a good time to not be evil. 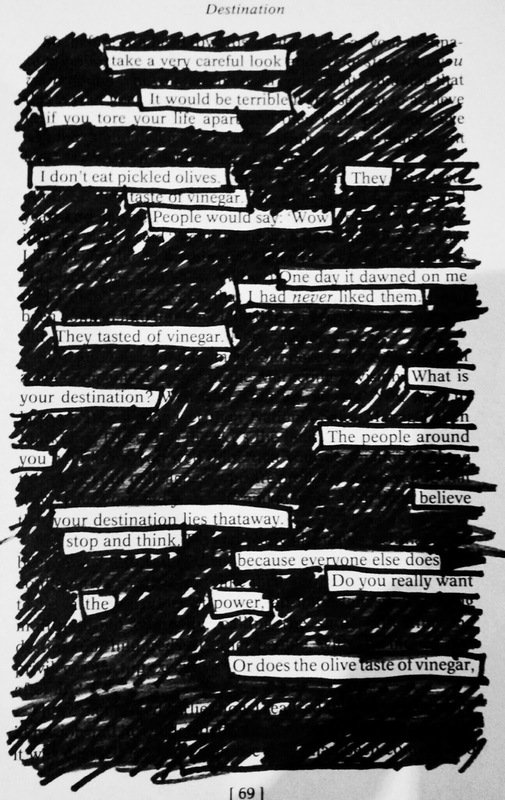 Not hear it, see it or say it. Day 83. I'm very interested in the effects of randomness on creativity. Or if not true randomness, then at least the effect of what happens when a creator gives up a level of fine control and allows "happy accidents" to occur. Today's create uses an iPad app called Musyc to create a simple rhythm. It's an interesting approach to creating music, by throwing objects at walls to allow them to bang and crash and bounce against them, making sounds. By added sequence generators which spit out objects in a regular pattern, some interesting effects are created. I really like seeing different approaches to music making. The video doesn't really do it justice as the screen capture must be quite processor intensive as it stuttered a little, making the regularity of the rhythm less regular than it actually was. Still, you get the idea. Day 82. Woke up to a brisk South Coast morning today. Wandered through the kitchen. Spotted this small specimen on the bench. I can't resist a good visual pun. 'nuff said. Day 81. Today I discovered a really interesting app called Foldify that lets you design foldable 3D shapes out of paper, cut them out with scissors, and glue them together to assemble the 3D shape for real. This was just a simple example (bit short on time today) but I plan to play with this tool a bit more to see what else I can create with it. 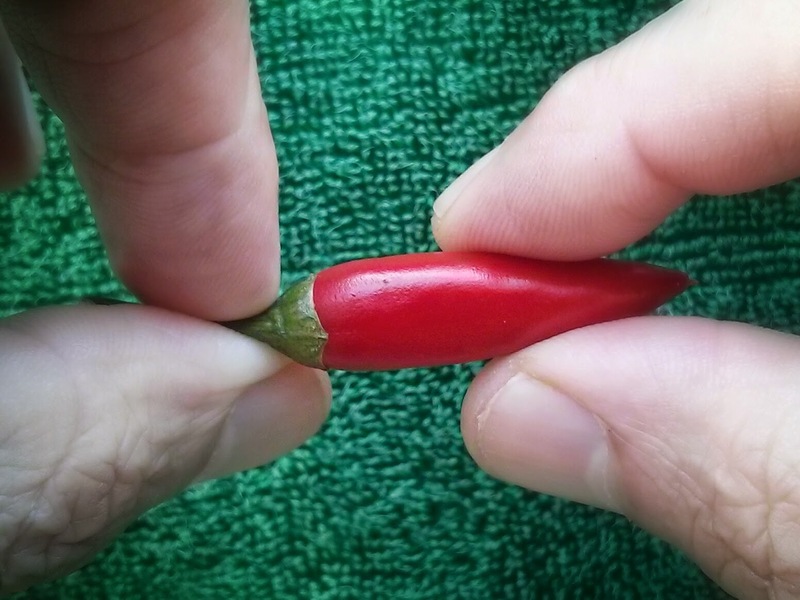 This would be a really fun way to teach about 3D shapes with younger students. Day 80. The glare of the lights, the roar of the crowd, the thrill of the beautiful game. Foosball. This very short video was made using a GoPro camera, edited with iMovie on a Mac, with sound effects from SoundDogs.com. It was also the first time I've tried using the Action Replay option in iMovie. Thanks to Al for his help with this one. Day 79. Today's create is a result of messing around with an iPad app called ProKeys. This was one of those apps that I had on my iPad but hadn't really played with much so I didn't know what it could do. I thought it was just a playable keyboard app, but in fact it has some pretty sophisticated digital synthesisers built into it, as well as a multitrack recorder. I made this track by overdubbing 4 keyboard tracks over each other. I'm not much of a musician, but it was fun to play with. There is no copyright on this: I put it in the public domain so if you can use it for something, go for it. Day 78. At school today we had a fun activity for our Year 11 homerooms. As a group, they had to come up with a chalk drawing based on a given theme. After a bit of brainstorming the day before, they created this idea for their artwork. I propped up the iPad and set iMotion to shoot a frame every 5 seconds to create this short video of their work. I'll bet you can't guess the theme. Partly because I'm not sure we actually met the brief for the theme at all, but mostly because the theme was pretty darn obscure in the first place. Day 77. Stopframe animation of a clock. Time was running out to get today's create done so I took 10 stopframes of each numeral on our kitchen clockface using iMotionHD on the iPad, then saved it as an MP4 video file. But rather than a video which just plays once, I wanted it to loop over and over. So I found an app called GifBoom that converts video files to gifs and I got it posted just before midnight for today's daily create. See how time flies when you're having fun? 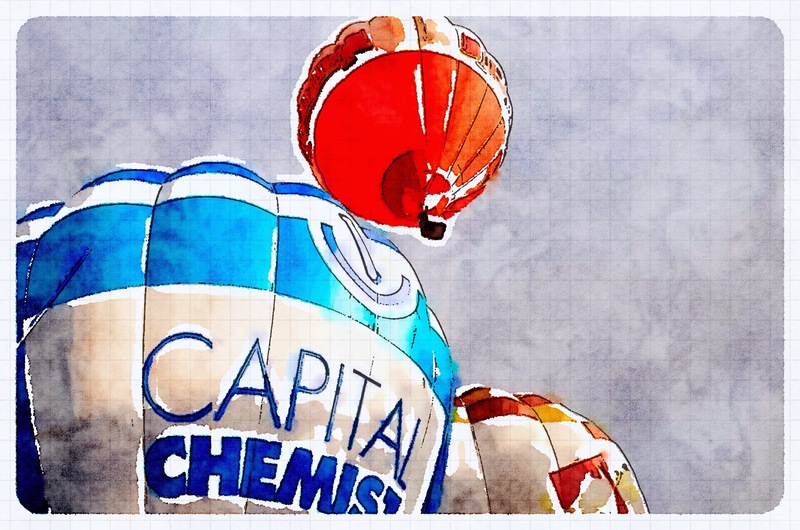 Initially, when I posted this from Blogsy on the iPad, the animation didn't work. I had to log into GifBoom on my computer and find the actual embed code and update this post with that. Now it seems to work fine. We live just up the street from a frame shop, which sits on the corner of the intersection. While out walking the dog tonight I stopped near the frame shop and was struck with an idea to make a stop frame animation. So this is 300 frames at the frame shop. It was shot on my Nexus 4 phone using an app called Lapse It Pro, then rendered and exported as 720 mp4 files, editing with a Android Movie Studio, and uploaded to YouTube. It's proof that you can make media on Android but let's be honest, it's still got a lot of catching up to do to compare with the media production capabilities of iOS. Day 75. I had lunch today with some friends from art school whom I hadn't seen for quite a while. As we enjoyed lunch and each other's company we talked a lot about creativity and the effect that attending art school had on the way we see the world. As we talked I noticed some "wire drawings" on the gallery wall, so I thought I'd have a go at making one myself. 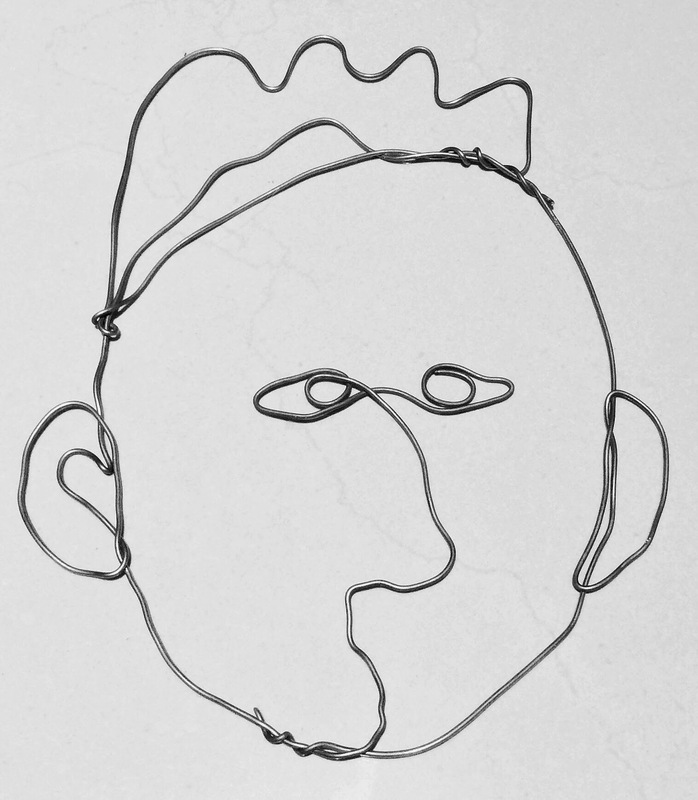 This "drawing" is made of bent wire (soldering wire actually). After photographing it on the kitchen floor with my iPad mini I used Google's Snapseed filters to boost the contrast, brightness and sharpness. Day 74. In case you can't tell, I'm rather interested in the idea of creativity... What it is, who has it, and how to develop it. For today's daily create I'd like to share with you a Flipboard collection I've been putting together focused on creativity. Flipboard is one of my favourite apps, both on Android and iOS and the web, not only because it's a good way to consume content, but it's also a really great way to curate content from all over the place into a single collection. 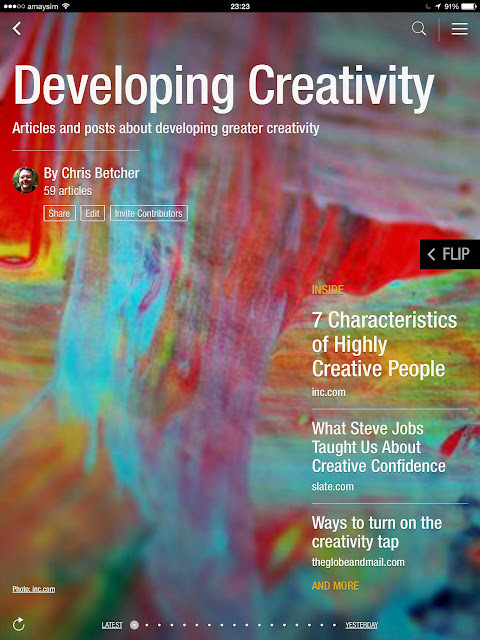 This Flipboard curation, called Developing Creativity, is a continually evolving collection of articles and posts about creativity that I will keep adding to over time. Enjoy! Click the image above to open the collection in Flipboard. Day 73. It's easy to overlook the interesting things in our daily environment. For today's daily create I wandered around our school playground and took 9 photographs with my iPad mini looking directly at the playground from above. While taking these perpendicular shots I was looking for interesting textures and shapes and patterns. 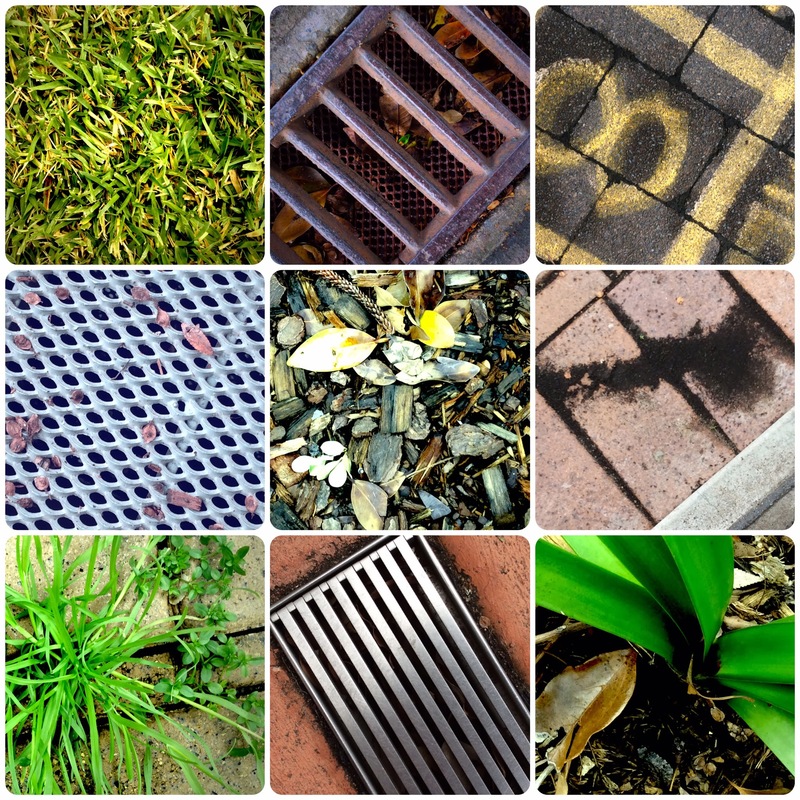 I then arranged them into this 3x3 grid using Diptic to create this final result. There is something about grid layouts that really appeal to me, even going right back to my days at art school in the 80s. I often found myself coming up with visual ideas that were based on grid layouts. Not sure why, I just like them. I want to offer a hat tip to Ross Wallis for this idea. Ross is a fellow Adobe Education Leader from the UK. He mentioned this idea to me several years ago at an Adobe Summer Institute in San Jose and he was originally making these photo grid designs using InDesign. Day 72. I'd never heard the term Knolling until today. I was driving home listening to the Macbreak Weekly podcast where they talked about it. In fact, I had no idea that there even was a term for this behaviour. Apparently there is. Google it if you want to know more. 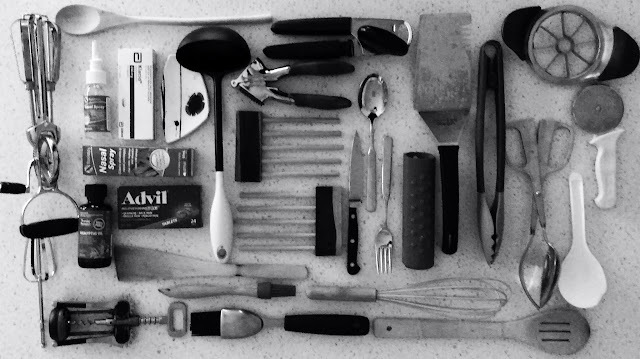 So here is today's daily create, my first Knolling image, taken on the kitchen table with whatever objects I could find nearby. Day 71. 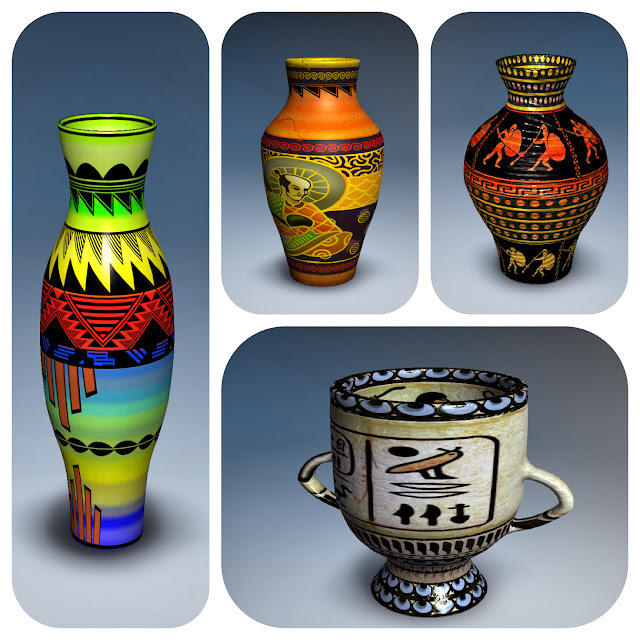 The Pottery HD app allows you to make virtual pottery on a virtual pottery wheel. It's obviously not the real thing, but it's a bit of fun to play. It even teaches some interesting things about different types of clay, throwing techniques, and even helps you learn about some art history with the use of different patterns and pot types that were used in different cultures. Day 70. I was in Canberra on the weekend to photograph the hot air balloon festival, and I just uploaded a bunch of my photos to Google+. While on G+ I noticed a couple of posts from Andy Inhatko about an iPad app he was very enthusiastic about called Waterlogue. 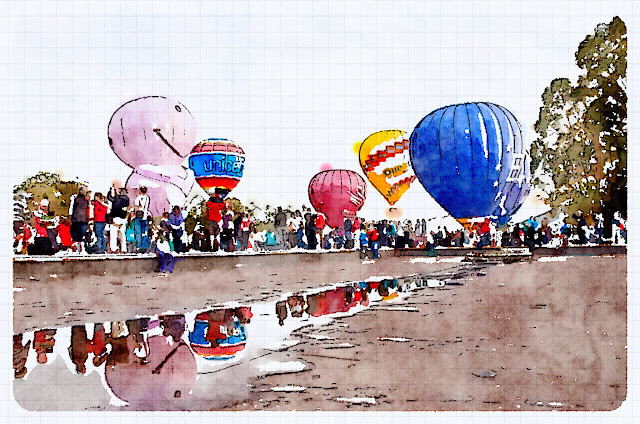 It turns your photos into surprisingly realistic and good looking water colour paintings. I have a few further ideas about how I might use this app. 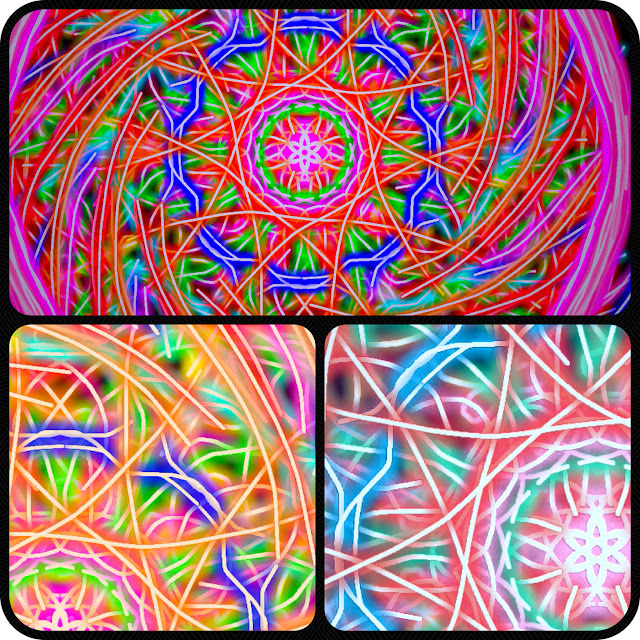 Meanwhile here's a few samples of what it can do for today's daily create. Day 69. 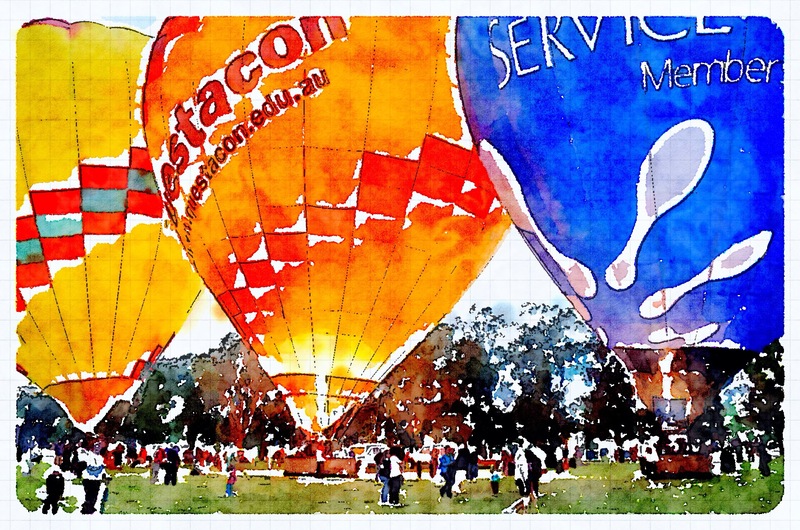 Linda and I spent the weekend in Canberra, Australia's national capital. We went down there for the hot air balloon festival but were pleasantly surprised to find out that Enlighten was also on. Enlighten is a light show on several of the nation's iconic buildings like the High Court, the National Library, the National Art Gallery and Old Parliament House. So I wandered around the Parliamentary Triangle until after midnight last night taking photos in the dark and the drizzle. I threw out more than I kept (the joy of digital photography) but here are just a few, presented as my daily create. You can click each photo to enlarge it a little. Day 68. I've just come back from a 2 hour night photo shoot, so I would have liked to post some of those shots as my daily create but they are still on the "big camera" and I can't transfer them at the moment. 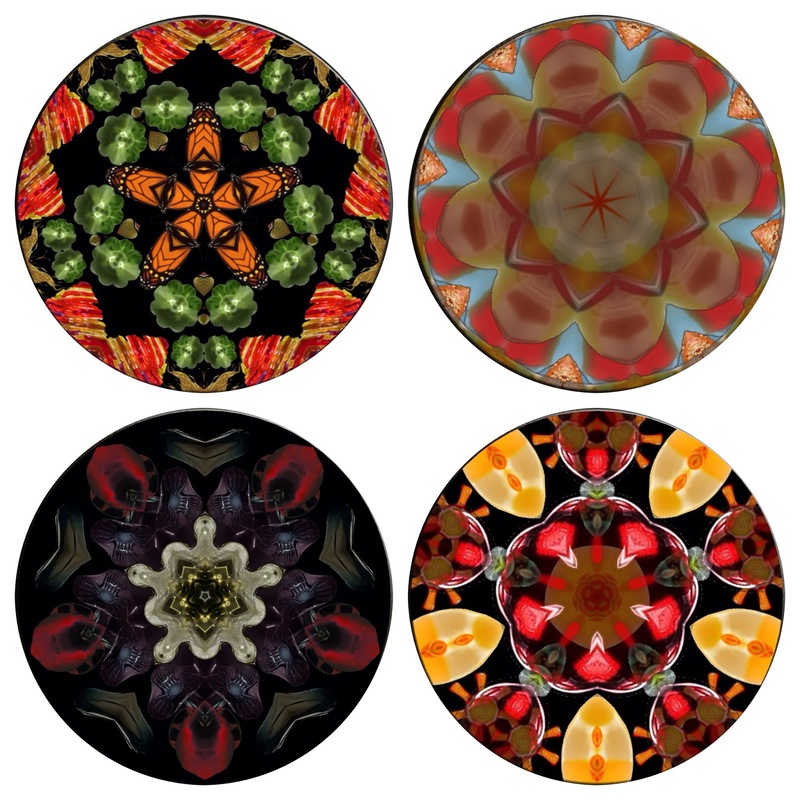 So today's create will be another kaleidoscope image, created with yet another kaleidoscope app, this one us called Kaleidoscope. Surprise! It works much like the others, but has a few cool features. I like the neon effects of the lines. I arranged three instances of the final kaleidoscope I made in a three panel Diptic frame, then applied filters from within Diptic to make then a little different to each other. I'm trying to use the basic artistic principle of unity versus diversity. The same but different. Repetition without regularity. Day 67. Take GarageBand for the iPad. Create multiple audio tracks. Build layers of sound using several built-in Apple loops. Choose loops that are from various cultures that would not normally go together. Put them together anyway. Build some kind of song structure. Be creative. See what you end up with. Day 66. After yesterday's daily create was crossposted to Google+ it received a comment from +Neil Boyd that referred me to the work of an artist named Tom Philips. 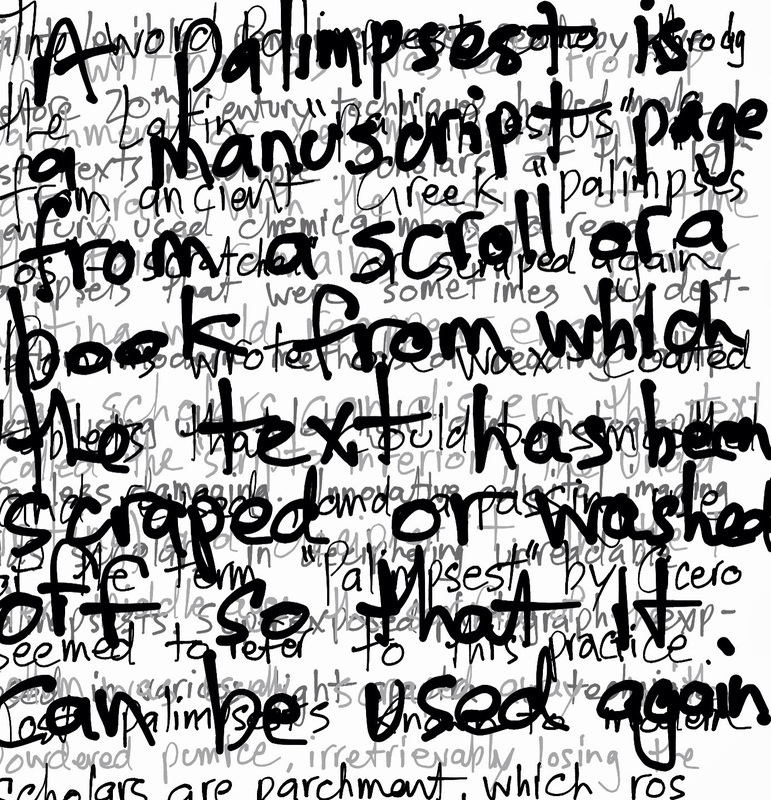 In his comment, Neil also used the term "palimpsest", which I had never come across before. Being the curious person that I am, I looked up the term and was fascinated by it. You can read the Wikipedia article if you want to learn more, but it inspired today's daily create. This was made on an iPad mini using the Notability app and a Jot Script stylus, then exported to the camera roll and applying the Noir filter. The text comes from the Wikipedia article about Palimpsests, which is published under a Creative Commons BY-SA licence. Thanks for expanding my vocabulary Neil! Day 64. More mandalas today. These were made with an iPad app called TumbleVision, which is basically a simulated kaleidoscope app. After generating a few samples I used Diptic to arrange them in a 2x2 grid like this. Simples! Day 63. One very popular tool for educators are tag cloud generators such as Wordle. However, being Java based, Wordle doesn't really work on most tablets. So I was interested to find this app called Word Salad, which does pretty much exactly what Wordle does, but on the iPad. It's really easy to use and has quite nice output, and it easy to customise. 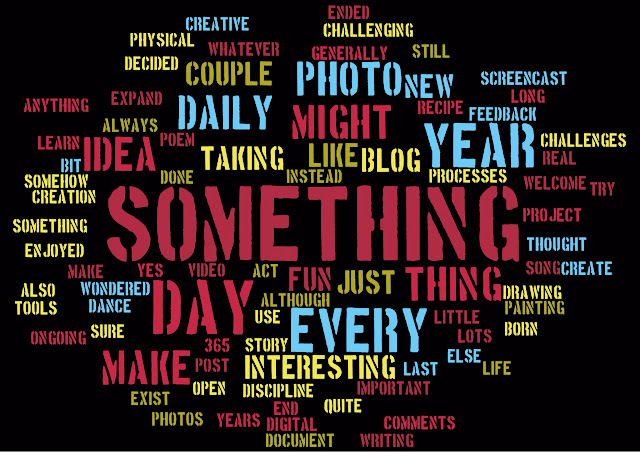 Today's daily create is a tag cloud based on the About page from this blog. Day 62. My son dropped by tonight to pick up a bass guitar that belonged to a friend of his. As he took away this bass, which was one of two basses I had in the house, the pun "stealing second bass" came to my mind. 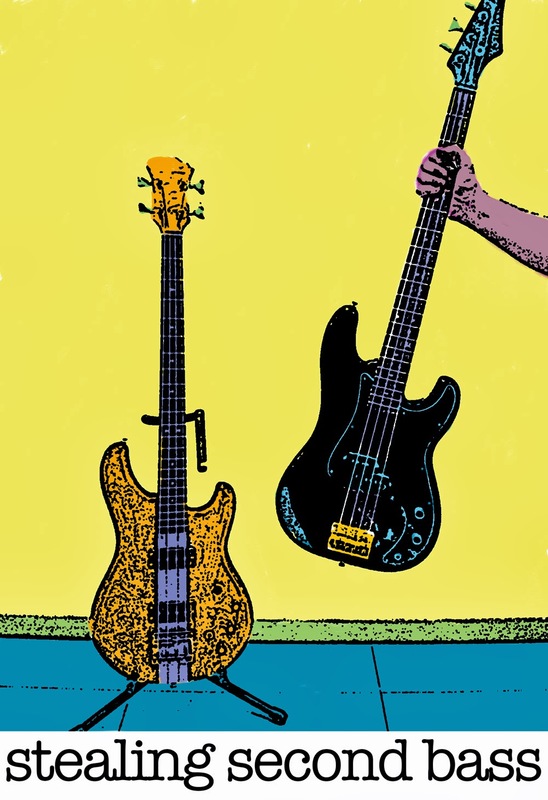 I'm always one to enjoy a good visual pun so I set up this photo with Alex holding the second bass guitar, took it with my Nexus 4 phone, dropped it into Adobe Photoshop CC and after a bit of manipulation ended up with this image. The original photo was duplicated onto a couple of layers, had a stamp filter applied to it at different intensities, then the layers were merged to combine the best exposures to bring out the details in the right places. 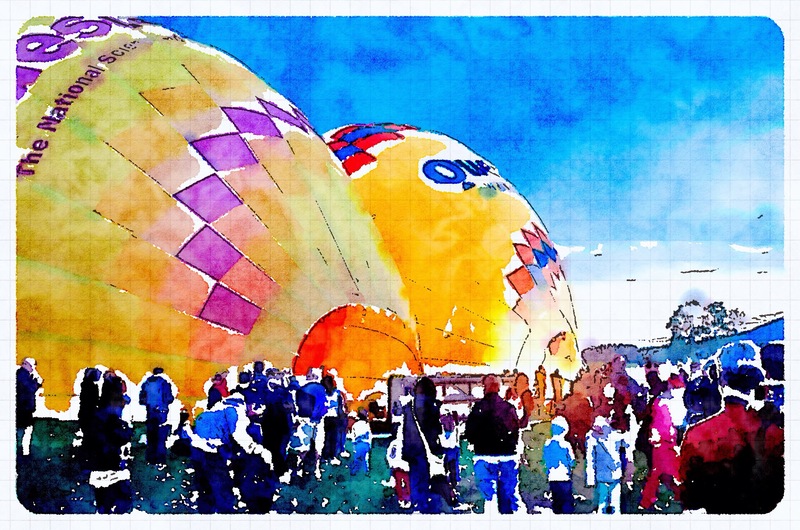 Then I used a Wacom tablet and the brush tools to paint in the coloured background by hand. I was originally thinking of a quite different graphic effect, but as I worked on it I quite liked the emergence of the flat pastel look so the image went that direction instead. Day 61. As well as this blog, I also maintain my main blog over at www.chrisbetcher.com. I don't write on that blog as much as I used to, but when I do, I try to write something of some substance. The writing there is just as much a creative act as anything I do here, which is why I think it's fair enough to include blog posts from there as daily creates over here. Day 60. Some daily creates are just for fun. Others are to solve an actual problem. Today's is one of those. 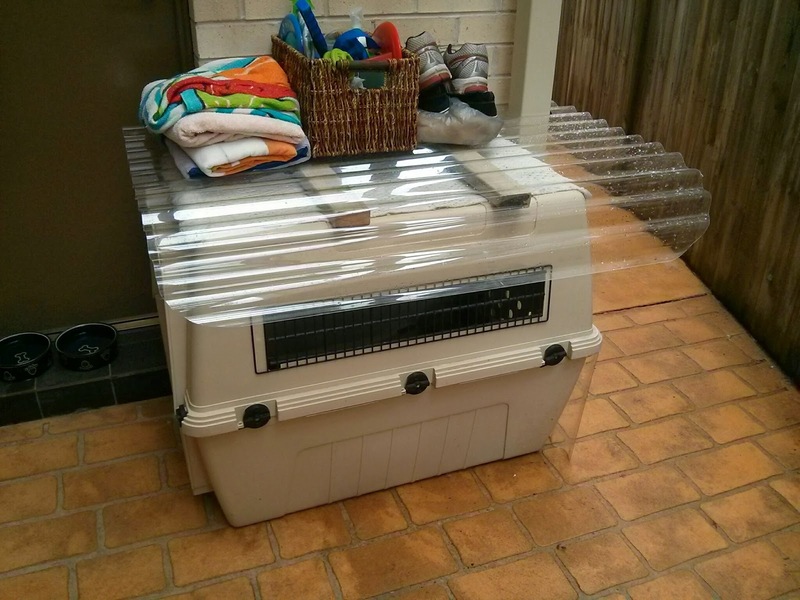 It's been pouring with rain here in Sydney and our golden retriever's dog house has been getting a bit damp. It is under cover from our pergola roof, but only just, so if the rain is heavy or coming from a particular direction, it can get a bit of water coming into it. What it needs is its own roof. I had a spare sheet of corrugated polycarbonate from when I built the pergola roof, so I took to it with a pair of scissors and fashioned it into a temporary rain shade that can go on top of the dog house. I had to cut notches to fit around the roof support posts, and round the corners so we wouldn't slash our legs as we walked past it, but it should keep the rain off until it fines up again. It's just a simple thing, but sometimes that's where a bit of creativity comes in the most useful.